We use ConfigServer Firewall (CSF) in many of our VPS and dedicated servers to easily manage firewall services. 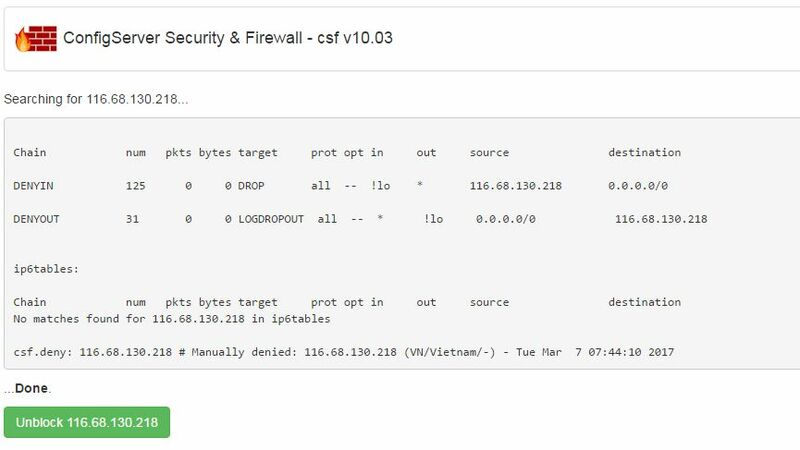 CSF uses a login failure Daemon (LFD) to track large number of failed login attempts based on IP address to the server by watching logs. If more than a certain number of login failures happens from a particular IP address, the IP will be blocked temporarily and eventually permanently if it continues. replace "" with your IP address you need to remove the IP block. You can also do the same from the WHM interface. Login into WHM as root and you will see ConfigServer Security&Firewall under the Plugins section in the left-hand menu. Open the interface, once you are in you will see a "Search for IP" button. You can click the "Unblock IP address" button to unblock the IP address.